What a terrific treasure you’ve turned up! 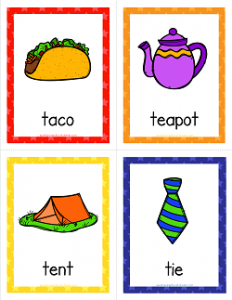 All these things that start with t: taco, teapot, tent, tie, tomato, tooth, top, and turtle. Eight cards of totally triumphing with T’s!!! (Okay, I’ll turn the drama down a notch. ha! ha!) Plus, you get the added bonus of four more cards – one title card, two cards with the eight words in smaller print with the pictures, and one card with all eight words and no pictures.